TigVision Front Travel Limiter kit is designed to limit front end suspension travel to fine tune your 60 foot times. Adjust your front end in 1/4" increments with 12 positions. Stainless steel chain and quick release pins and zinc plated adjuster. 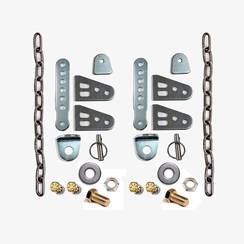 Comes with BOTH bolt on and weld on tabs in this kit. MADE in USA.